Description: extremely clear sound quality to enhance the high-end equipment, the low frequency is quite solid and has the jumping ability, low-frequency performance is particularly stable, and thus the sound field is clear, richly detailed piano, music to restore the overall upgrade. Octopus latest a "reference level" American sound dedicated power supply, stable, beautiful appearance, very good anti-seismic and anti-jamming capability, close contact with the power supply smoothly and with no clutter. Sound quality to enhance the high-end equipment is extremely low frequency is quite solid and jumping ability, low-frequency performance is particularly stable, and thus the sound field clear, richly detailed piano, music to restore the overall upgrade. 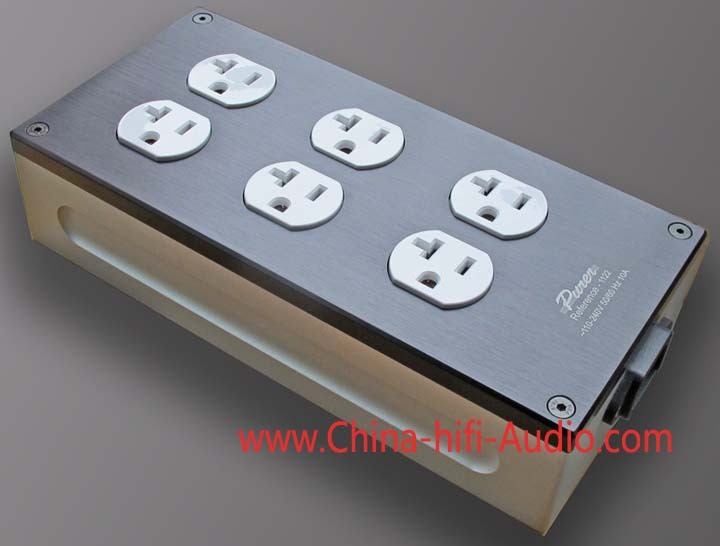 Supply the base of thick aluminum alloy material, high-precision computer CNC lathe, dug by cutting and Xian, thick brick of aluminum processed into integrated cabinet base, the top cover panel also uses thick aluminum up to 8mm from finishing. To bottom is very close. The silver base of sand with the bright black brushed the top cover panel appears elegant and sophisticated, the notch of the base on both sides of the processing of an arc is both decorative and convenient moving, humane design. good electric field shielding, can inhibit the intrinsic electric field diffusion of radiation, but also to eliminate the interference of external electric field. * The box is very calm, so that the power cord plug contact is tightening able to withstand any mechanical vibrations, make the equipment safer and less clutter. precise. Power outlet is also a gold-plated products, the internal wiring of the five-star single crystal copper, the entire current transmission process noise is small, neat. Can give full play to the potential of the equipment, the sound is pure and natural, large dynamic music show calmly This supply is equipped with padded, no need to set foot, shock effects are particularly good. This supply without power switch and overcurrent protection devices for electrical safety, must be connected to the switch leakage and overcurrent protective devices on the power supply system. Equipment when not in use, turn off the power switch on all the equipment, environmentally friendly and safe. Can be widely used in the place of the audition room, high-definition theater, precision instruments, music performance hall.